This figure debuted in the United States on The Power Of The Force card, and in Europe on the Tri-Logo card. It was never packaged on a Canadian card. This figure was also package along with Amanaman and Barada in the second edition of the Return Of The Jedi Sears exclusive Jabba The Hutt Dungeon Action Playset. 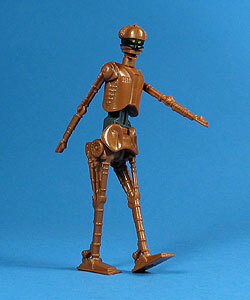 Comments: Believe it or not, EV-9D9, the creepy tobacco throated droid from Jabba?s Palace was actually a female droid! Yes, that?s right, in the old days of Star Wars this little lady shared the pages of the annual ?Hot Chicks In A Galaxy Far, Far Away?? calendar. Humana. Humana. Humana. Major Variations: Though all vintage figures have minor variations, the EV-9D9 action figure has no known major variations. It is important to note however, that this figure was never produced with the metallic finished like the figure used in the photography from the card backs and Planetary Maps pack in catalogs. This figure was actually a huge accomplishment in design, being the first 3 3/4? action figure to feature a functioning mouth. The EV-9D9 figure is prone to losing its arms. Due to the necessities of its design, there isn?t much to hold them in place, and break off incredibly easy. The legs are removable, like 8D8?s, but considering the rarity of this figure, it is not recommended. In extreme cases where leg replacement is the only option, it is recommended to dip the figure in warm water for a few moments. It is important to note, that putting the figure in boiling hot water could crack or discolour the figure.